I am searching for any of my grandmother’s sibling’s family. 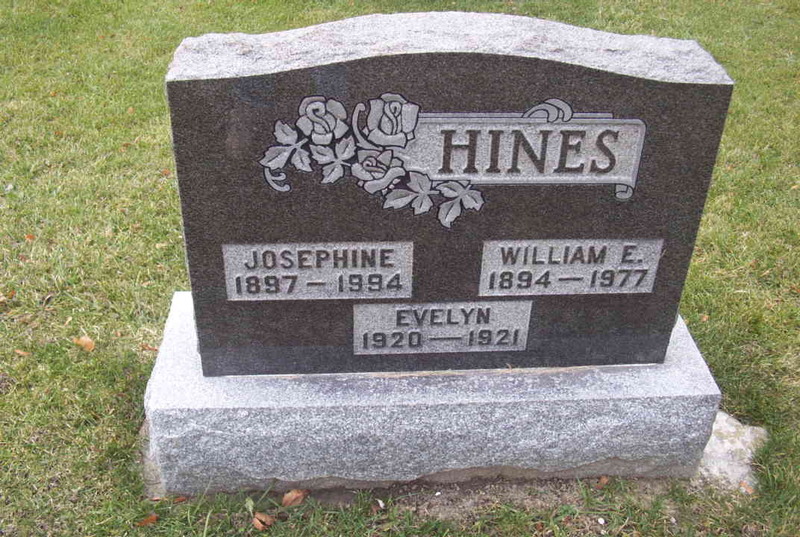 My grandmother, Josephine, was born in Essex County in 1897. Her family was from the Charlevoix Quebec area and came to Essex County, Ontario about 1890. John Desbiens and Celina Tremblay had a large family but I don’t know much about them other than what I have from obituaries. As far as I know, three of her oldest siblings were born in Quebec, the rest were born in Essex County. If you are researching these families or have any information about them, please leave a message or contact me. My Tremblay and Desbiens lines are all tangled up, with generation after generation of intermarriages between the families for over three hundred years. Etienne Benjamin Desbiens married Felicite Savard in 1768, great-great-granddaughter of Etienne Desbiens II and Marie-Dorothee Tremblay through their daughter, Marie-Francoise Desbiens . That’s just the tip of the iceberg, just my direct ancestors before 1800. My great-grandparents, Jean Desbiens and Celinase Tremblay, married in 1883, are just one of the many Desbiens-Tremblay marriages in the 19th century. I imagine there were lots of inter-marriages in New France and Acadia, and everybody is related who live in or came from the area. It seems like any time I meet someone with French-Canadian roots, I have at least one ancestor and more often, several ancestors in common with them, and that’s with only one French-Canadian grandmother. It doesn’t seem that illogical, when I think about it, with the religious restrictions of marrying outside of the Catholic faith, and the population increases in New France were from reproducing, not from immigration after the 1600’s. They were from already established families with a limited gene pool to fish from. 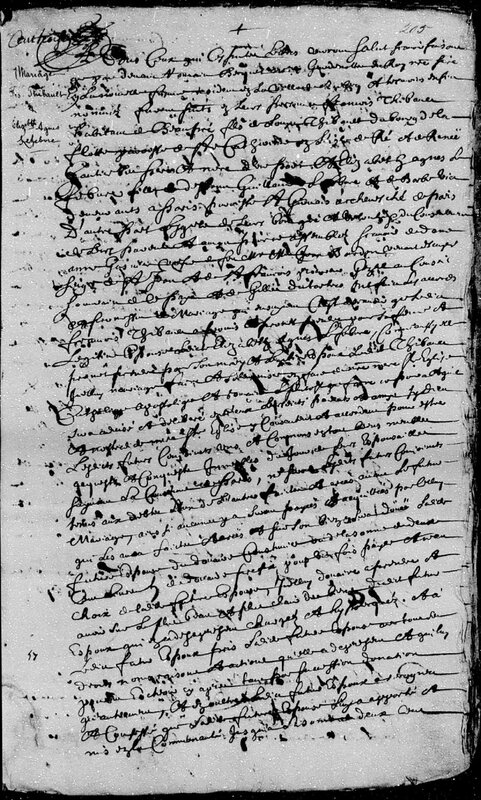 After the expulsion a lot of families from Acadia came to New France , and, over the years moved back, so the Acadian surnames are found in Quebec as well. 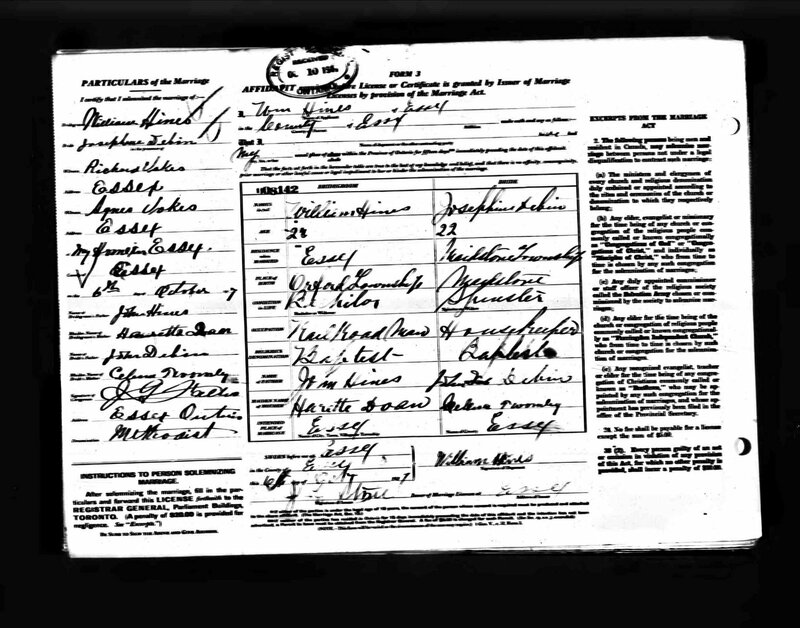 Etienne Debien is my immigrant ancestor of the Desbiens line, my eighth great-grandfather. 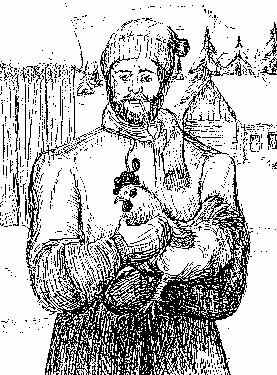 Etienne Debien was born in 1648 in Moulisme, Poitiers, France and came to New France in the 17th century. 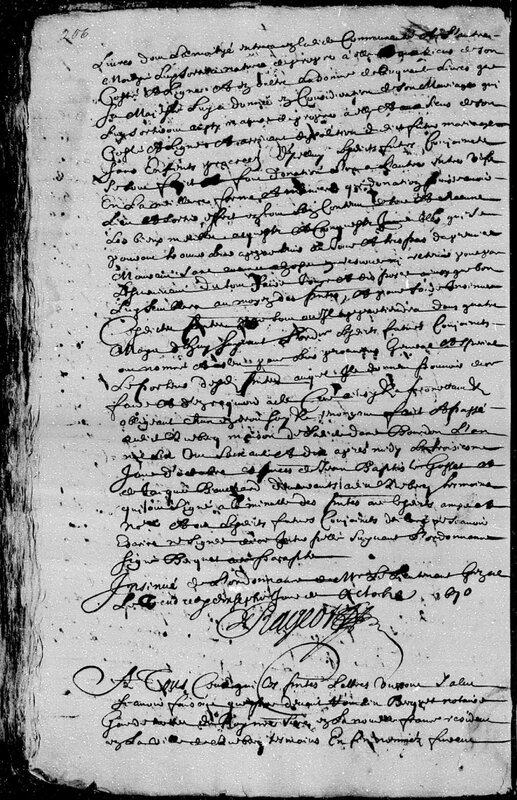 On Jan. 2, 1691 he married the Montreal-born Marie Campeau, daughter of Etienne Campeau and Catherine Paolo who came from LaRochelle, France. She was the recent widow of Nicholas Pilieur. Marie Campeau had four children with Nicholas Pilieur: Jean, born in 1686, Nicholas and Marie, born & died in 1687 and Etienne, born in 1690. Etienne, born in 1691, Francois, born in 1693, Michel, born in 1695, Antoine, born in 1697, Joseph, born in 1699, died in 1722, Marie-Josette, born in 1700, died in 1703, Marie-Anne, born in 1702, died in 1703, and Jean-Baptiste, born in 1704. After Etienne’s death Marie Campeau remarried to Julien Perusie dit Baguete in 1710. 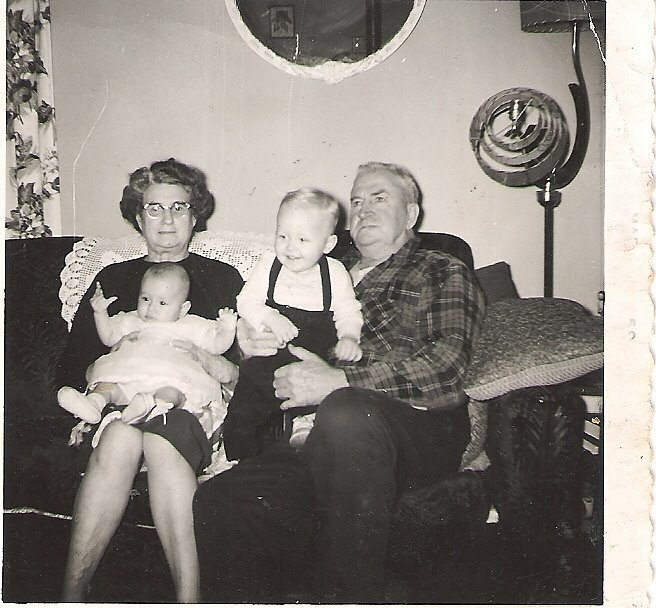 My grandparents, Joephine Desbiens & Wm. Hines with my older brother, Fleming, and I. 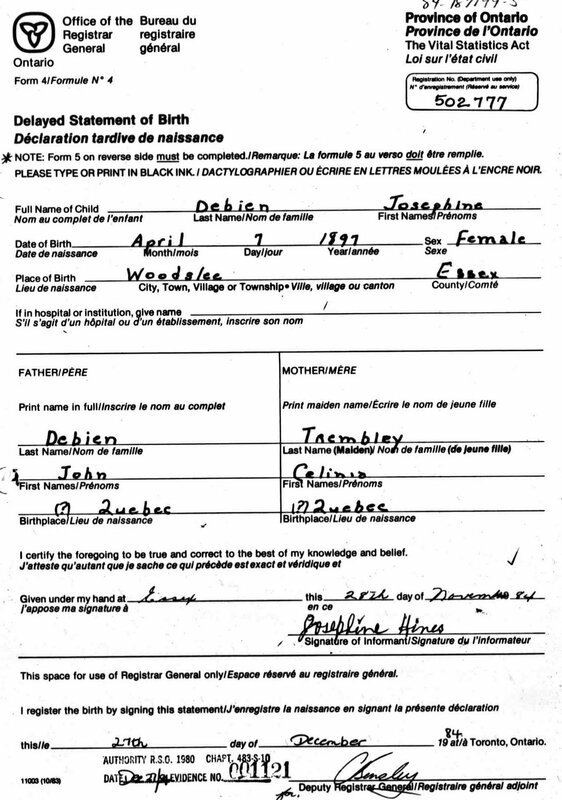 My grandmother, Josephine Desbiens was born in 1897 in Essex County, the daughter of John Desbiens And Celinase Tremblay. She grew up on her father’s farm in Maidstone Twp., Essex County with several brothers and sisters. She married William Edgar Hines, son of John Haines and Harriet Doan of Rochester, in 1917 and moved to Essex in the house that her husband and his brother built. He worked for the railroad, so he built his garage from railroad ties. The railroad ran right behind their property. It was a modest house on Arthur Avenue in the town of Essex. It was well-taken care of, but showed the efects of the history of the town and railway, the walls weren’t square, as a result of a nitro-glycerine explosion in a traincar at the railyard. Most of the homes in town at that time were moved from their foundation a little that day. That was not the only incident in the house, while my grandmother was out hanging laundry, the house caught fire with their two daughters inside. The oldest daughter was able to get out, but the youngest daughter died of burns. They had three more children after that, a daughter and two sons. She passed away on July 4, 1994 at the age of 97. Francois-Louis Thibault was born June 28, 1647 in Sainte-Catherine-de-la-Flotte, Ile de Re, Aunis, France. He married Elizabeth-Agnes Lefebvre, a fille du roi, on October 14, 1670.